If you ever notice your gums bleeding, the first thing to do is not panic. Sometimes bleeding gums are a temporary side effect of starting a new oral care regimen. Other times, it can be more of a concern, but you won’t know until you notice other symptoms along with it. To help patients stay informed, your dentist in Keller wants to explain a few reasons why gums may bleed. It’s common for bleeding to occur when patients start a new flossing routine. Whether it’s their first time flossing or they forgot to floss for a few days, bleeding is quite common at first. Once you make a daily habit of flossing, the bleeding will cease. However, if bleeding doesn’t stop after a week, you’ll want to pay your dentist a visit. Bleeding can also occur if you switched to a firm toothbrush when you’ve been using a soft-bristled toothbrush for a long time. To prevent bleeding, switch back to your previous toothbrush and discuss with your dentist which one would be right for you. Blood thinners have been linked to bleeding gums according to the American Dental Association. Since blood thinners decrease the body’s ability to clot, bleeding can occur more easily. If you experience this regularly, either when brushing, chewing, flossing, or even doing nothing at all, tell your dentist. Make sure that your dentist is aware of all the medications you are currently taking. In the first stage of gum disease, bleeding gums is a telltale sign. This first stage is known as gingivitis and is one of the most common forms of gum disease in the world. When plaque collects along the gum line, it can easily infect the gums. Gums affected by gingivitis may be swollen, tender, and bleed while brushing. Luckily, treatment for gingivitis simply requires a more diligent brushing and flossing regimen as well as biannual checkups from your dentist. If you are pregnant, you may experience a condition known as “pregnancy gingivitis.” This condition can occur in pregnant women due to hormonal changes in the body. These changes alter the body’s response to oral bacteria that causes gum disease. Fortunately, this is only temporary, and the effects will clear up after pregnancy ends. To manage it, simply brush twice a day for at least two minutes. Make sure to use toothpaste that is fluoridated, which breaks down plaque. 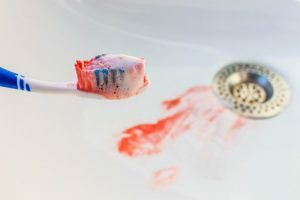 For bleeding gums, your family dentist in Keller will recommend more consistent oral hygiene at home and more frequent dental cleanings if that doesn’t help. However, if the bleeding continues, your dentist may need to perform periodontal therapy. The dentist may also seek help from a periodontal specialist if necessary. Not sure if your bleeding gums require professional treatment? Schedule an appointment with your dentist in Keller today to find out! Dr. Shweta Sinha earned her dental degree from the Herman Ostrow School of Dentistry. She strives to bring the best dental care to her patients with compassion, empathy, and helpful information. To learn more tips about what to do about your bleeding gums, contact her at (817) 431-6400 or visit her website.